remember when gianna’s was the only vegan cheesesteak game in town? that gg special. damn. then they lied about their vegan pizza cheese being vegan. such controversy. looking back, that sandwich was what, crumbled tvp? seriously garbage and we loved it. but now you have dozens of delicious options all over the city. enjoy. please keep in mind that i haven’t tried all of these, some of the bread probably isn’t vegan. delicious vegan cheesesteak, bigger chunks of seitan, they offer daiya vegan cheese and veganaise. definitely a must try if you’re in the neighborhood. the “vegan wizwit” has vegan cheese and is on a vegan roll. sadly no more cheesesteak. vegadelphia meat but with soy cheese and mayo it makes a great sandwich. they’ve got a fantastic vegan reuben too. thin sliced seitan, homemade vegan cheese whiz on a great roll. i’ve never had seitan sliced like this, so good. also has fantastic vegan pizza and other sandwiches. 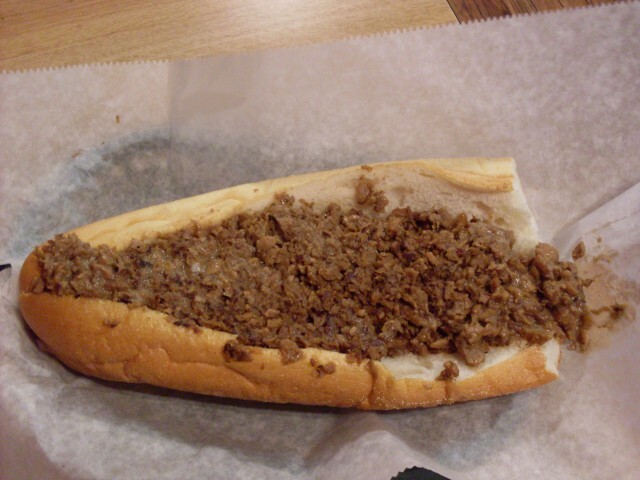 as of 12/18 this was my favorite cheesesteak in the city. great roll, vegan cheese, the works. seitan, vegan cheese, veganaise, peppers, onions on an awesome roll. plenty of other solid veggie&vegan options at this point breeze gem. vegadelphia meat. their sign now says “vegetarian c/s” probably because the roll is not vegan and they don’t have vegan cheese. vegadelphia meat w/optional non-vegan soy cheese, vegenaise, lettuce, tomato, onion, ketchup, salt and pepper. the staff is great and they’ve got a lot of other veggie items. seitan. they no longer have vegan cheese or vegan mac and cheese. it’s pretty good… but it used to be great. now it’s salty. sigh. their wings are still good though. great sandwich. vegan cheese. i recommend a chicken cheese steak with pepper steak sauce, it’s messy but worth it. portobello cheesesteak, probably not worth the $11 without the cheddar, but i haven’t had it. awesome cheesesteak – with mushrooms, lettuce, tomato and a vegan cheese sauce. everything else is just as great there. go now. classic philly veggie cheesesteak made with chunks of seitan. sometimes they have a seitan cheesesteak on special. but it’s on a non-vegan “butter roll”. so it’s essentially worthless and i shouldn’t even have mentioned it. sigh. great roll, delicious cheese sauce, peppers and mushrooms. apparently now uses vegadelphia meat instead of seitan. it looks like they replaced their veggie steak with a cheese heavy “roasted mushroom and seitan” sandwich. seitan cheesesteak with onions and mushrooms. uses Teese, vegan cheese by chicago vegan foods inc., used to have tofu ricotta, but no longer does; make mostly everything in house, meaning they can customize almost any pizza they have to be vegan. Can watch food being made, due to small size. No idea about their roll, but hoping it is vegan because it is delicious. 100% Definite cross contamination for those who are not okay with that. this is a great veggie steak. a little greasy, optional homemade cashew vegan cheese. vegadelphia meat but with some classic philly love put into it. this is definitely my favorite vegan cheesesteak in the city. seitan, mushrooms, fried onions, and vegan cheese on a roll that’s to die for — it reminds me of the formica brothers bread from atlantic city. seitan. served with long hots and mushrooms. this may have been the first veggie steak i had in philly about 10 years ago. as classic as the royal’s tempeh club. an indian veggie chicken cheesesteak. veggie steak with vegan cheese. veggie steak and veggie chicken steak. vegan steaks with daiya cheese. the closest i’ve found to a sloppy philly cheesesteak since gianna’s. vegan chicken or regular steaks with vegadelphia meat. they also have vegadelphia vegan crab cakes, btw. fast food vegan shop from the people behind vedge and v street. obviously it’s amazing. Vote for the best vegan cheesesteak in Philly 2017!